One of the most dramatic of foliage plants, Stromanthe sanguinea ‘Triostar’, also known as ‘Tricolor’, is certainly not to be missed in your garden collection. It is a hot favourite amongst foliage lovers worldwide because of its dazzling colours. 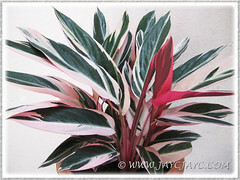 We brought home a lovely pot recently and are absolutely fascinated with its very colourful variegated leaves. Purchased it for RM10, relatively cheap as we could have sub-divided into a few more pots had we desired. 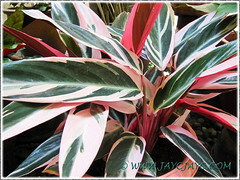 This jewel of a plant with vibrant technicolor foliage suits us fine! It is the perfect candidate for our courtyard that urgently needed random splashes of bright colours amidst its many shades of green to make it aesthetically interesting. It’s impossible not to be impressed by its dazzling foliage variegation. Recently, we added a pot of Vareigated Crinum Lily to complement and further enhance that area, as displayed in the left image. Origin: Native to the Brazil, Honduras and Costa Rica. Features: Stromanthe sanguinea ‘Triostar’, also known as ‘Tricolor’, is an attractive cultivar of the sanguinea species in the genus, Stromanthe that originates from the tropical forest of Central America. A fast-growing plant that can reach 1.5 m (5 ft) tall, but usually grows to about 60-90 cm (2-3 ft) in height when home-grown in a container or in the ground, and spreads to 30-60 cm (1-2 ft) wide. An evergreen, clump-forming rhizomatous herb that produces foot-long, oblong to lance-shaped leaves that are exquisitely arranged in fans. These glossy and leathery leaves emerge from the base of plant and are held at the ends of long petioles. 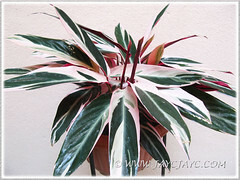 Foliage are heavily variegated in various hues of green, white and pink on the topsides while the undersides are a brilliant reddish-pink or burgundy-pink. 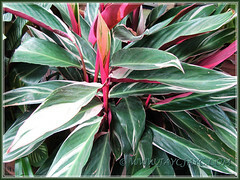 Truly dramatic colour variegation and no two leaves are alike as each is uniquely patterned. Like many species of the Marantaceae family, Stromanthe sanguinea ‘Triostar’ has the characteristic feature of folding up their leaves by means of a tiny joint or lump (pulvinus) between the leaf blade and petiole, at dusk or on cloudy days, like hands held upright in prayer. And, in the morning till early evening, the leaves will return to normal position, that is, almost perpendicular to the petioles. Intermittently throughout the year, it produces inconspicuous white flowers that are sheathed in attractive reddish-pink to red-orange bracts. They are borne in short racemes atop the long, leafy stems that displays beautifully above the foliage. 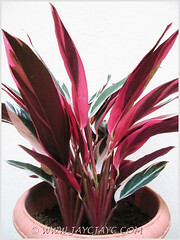 Culture (Care): Stromanthe sanguinea ‘Triostar’ or ‘Tricolor’ grows easily with minimum care, if provided the right conditions and nurturing. Light: Best in bright or partial shade with filtered sunlight. Can tolerate shade though the foliage variegation will be a tad dull. 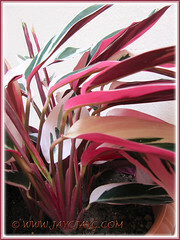 If necessary, relocate plant in bright light to intensify the colour variegation. Never locate it in direct sunlight that will scorch the leaves. Moisture: Moderate water requirements. Water regularly but do not overwater and try to allow the soil to dry out slightly between waterings. Never allow soil to dry out completely at any time. Soil: Prefers well drained, nutrient-rich, garden potting soils, can be sandy loam or clay loam. Others: Feed every fortnightly with a liquid fertilizer for foliage plants at half-strength. High humidity is most essential to prevent browning of the leaf margins. Plant will deteriorate quickly and look unsightly when the air is too dry, whether grown outdoors or in. If grown indoors, mist the plant regularly, use a humidifier or place the pot on a shallow pebbled-tray filled with water to just below the base of pot to help raise humidity. 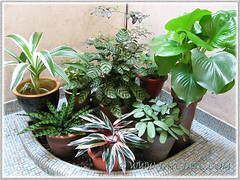 Keep indoor plants away from cold drafts and maintain constant normal room temperatures. Keeping it dust-free is beneficial, so wipe the leaves with a damp cloth or shower it once weekly. Carefully snip off the tarnished and dried leaves to keep it tidy. Generally, pest and disease free. However, do look out for snails, mealybugs and spider mites. For subtropical and temperate regions: Hardiness: USDA Zone 9b-11. Though a tropical to semi-tropical perennial, it can be grown outdoors as an annual or indoors as a houseplant in cooler regions. Remember that this plant thrives on high humidity, so do the needful. Keep soil constantly moist during hot seasons but water sparingly at lower temperatures, allowing the soil to dry between each watering to avoid rot. Feed once every two weeks with a balanced liquid fertilizer at half strength when actively growing from early spring right through to autumn and once monthly during winter. Best to groom your plants by cutting off dried and damaged leaves in spring before active growth and propagate plants by root division in late spring or early summer. It flowers in spring. Propagation: Easily by division of its rhizomatous clumps or rootstock. Best to do this when it needs to be re-potted or for temperate countries, in spring before active growth. Carefully separate the plants, ensuring that each division has a few leaves and strong roots intact. Pot each division individually in a good potting medium, wet soil thoroughly and site at a shady spot, misting regularly to ensure success. 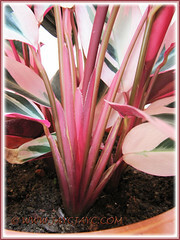 Usage: Stromanthe sanguinea ‘Triostar’ is an excellent choice for a tropical look, both in a container or in the ground. 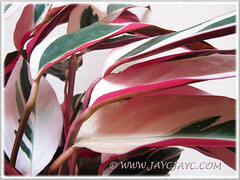 Its fabulous foliage variegation makes it a wonderful indoor plant in offices and homes for that extra splash of technicolor. Outdoors, it provides a year-round interest in the home-garden or landscape with its strikingly beautiful foliage for a spectacular view. As container plants, well-suited to decorate garden porches, decks and patios. Ideal eye-catching plants for garden beds and borders at shady spots or below large trees and palms. Can be used in bottle garden or terrarium. Here’s sharing Stromanthe sanguinea ‘Stripestar’, another variegated cultivar that is not as colourful and impressive as the ‘Triostar’. On the topside, it has a single, white to pale-green down the middle of each dark green, glossy leaf while the underside is dark purple or maroon-pink. 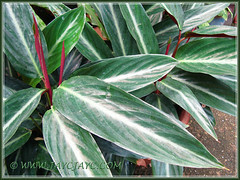 Fabulous foliage plant. I only have one. I think I need to find a couple more! Indeed, Bernieh… can’t do without to add glamour to one’s garden ya! Thanks for dropping by… much appreciated. Have a wonderful weekend. I live in the philippines, i have potted plant like this. The problem is the leaves are turning brown on the edges and curls. How do tyou remedy this? Leaves turn brown and curl if the air is too dry or your potted plant is located in full sun. Hence, try to provide high humidity or mist the plant frequently.